Liza Ann Acosta teaches Comparative Literature at North Park University and is an artistic associate of Chicago’s only all-Latina theater company, Teatro Luna. Mary-Terese Cozzola is a writer and filmmaker. Her prose and poetry have been published in Crawdad, After Hours, and Swivel, and her films have screened at the Gene Siskel Film Center, the Chicago Short Comedy Video & Film Festival, and the Midwest Independent Film Festival. She has performed solo pieces at the Stockyards Theatre Women’s Performance Art Festival and SpeakEasy/SpeakHard: the Malinowski salon. You can learn more about her work at www.mtcozzola.com. She lives in and loves Chicago. Steve Timm is a poet and author of ’n’altra storio, Disparity, and the chapbooks Stragetics and Averrage. He was the performer in A Poem by Steve Timm, a video by Ya-Ling Tsai chosen for the 2004 Wisconsin Film Festival. He teaches English as a second language at the University of Wisconsin-Madison. As actor, educator, and writer ARLENE MALINOWSKI views solo work as an artistic extension of the social justice work she has been doing for the last twenty five years. Her five solo plays including What Does the Sun Sound Like and Aiming for Sainthood have been produced and performed in venues nationwide including St Louis Center of Contemporary Art; 16th Street Theater, Chicago; Los Angeles Women’s Theatre Festival; HBO Workspace; NoHo Theatre Festival; Ojai Solo Series; National Center on Deafness; West Coast Ensemble; and Blue Sphere Alliance, as well as at numerous colleges throughout the country. Most recently she performed a new piece which was named one of the five best solo shows by Windy City Times. Her solo work has been honored with an LA Garland Award and nominations for the LA Weekly Award and the Los Angeles Theatre Ovation Award. As an actor she has appeared in numerous theater productions including the world premiere of By the Music of the Spheres at the Goodman Theatre in Chicago. Other favorite roles include Lovers and Other Strangers, Labor Pains, Chapter Two, One Flew Over the Cuckoo’s Nest with Deaf West, the critically acclaimed In A Different Voice and Faith, Hope and Clarity. MEGAN STIELSTRA is the Literary Director for 2nd Story, a personal narrative storytelling series held in wine bars where she regularly tells stories to drunk people. She’s performed for the Goodman, the MCA, the Cultural Center, the Neo Futuraium, Story Week, Wordstock, all sorts of bars and conferences, a vineyard, Opium’s Literary Death Match (which she won. Because Literature is a dangerous thing!) and regularly on Chicago Public Radio. She teaches creative writing at Columbia College and The U of C.
JOTHAM BURRELLO is an adjunct faculty member at Columbia College Chicago where he directs the publishing lab, a resource for emerging writers. His writing has appeared in Eleven Eleven, Drunken Boat, Oyez Review, Pennsylvania English, the Christian Science Monitor, and elsewhere. He recently completed his novel, Fall River. He’s a former editor of the journal Sport Literate. His multimedia company, Elephant Rock Productions published the anthology All Hands On, The 2nd Hand Reader, and produced instructional DVDs for writers featuring Janet Burroway, Robert Olen Butler, Joe Meno, Rosellen Brown and others. He lives in Chicago with his wife and two little boys. 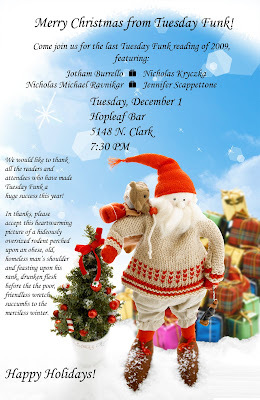 NICHOLAS MICHAEL RAVNIKAR (BA, University of Wisconsin; MFA, Naropa University) lives in Racine, WI,Jo B where he edits the irregularly published webzine, The Bathroom and is organizing with Nick Demske the first annual Racquetball Chapbook Tournament. His writing has appeared in most recently in Otoliths and Boo: A Journal of Terrific Things and is forthcoming in BlazeVOX and unarmed. His first feature-length documentary, Quilts on Barns: The Beauty of Rural Art, wrapped post-production in August 2009 and will be available for free viewing online soon. He’s currently working on a documentary titled SMALL PRESS, MIDWEST. Midwest-affiliated writers, publishers, readers and scholars interested in letting him interview them for that project can send an email to nicholasmichaelravnikar@gmail.com. He has facilitated workshops in poetry, video, installation art and journalism in a variety of settings, most recently in conjunction with the Racine Arts Council and Woodland Pattern. JENNIFER SCAPPETTONE, a translator, poet, and purveyor of visual stills and prose, is the author of From Dame Quickly (Litmus Press, 2009), and of several chapbooks. She is now at work on Exit 43 — an archaeology of the landfill and opera of pop-ups—for the cross-genre publishing project Atelos Press. Excerpts of that book appear in Belladonna Elders Series #5: Poetry, Landscape, Apocalypse featuring pop-ups and prose by Scappettone, a lyric sequence by Etel Adnan, and an essay by Lyn Hejinian (Belladonna, 2009); pop-up scores are now being adapted for performance in collaboration with choreographer Kathy Westwater as LAND. She was guest editor of the feature section of Aufgabe 7, devoted to contemporary Italian experimental poetry, and is at work on a range of translations from Italian, with a focus on the “Babeling deeply felt” of the postwar polyglot author Amelia Rosselli. A selection of Neosuprematist Webtexts, filmed stills, was installed at Infusoria, an exhibit of visual poetry curated by Helen White for the Festival Le Off in Brussels and Het Zilverhof in Ghent in 2009. A range of readings, a talk on poetry and landscape, and a podcast dialogue with Al Filreis are available for download at her PennSound author page. She is an assistant professor at the University of Chicago. ROBERT DUFFER has written for WBEZ’s 848, TimeOut Chicago, Chicago Tribune, Chicago Parent, New City, Chicago Artists Resource, Chicago Scene and others. Stories, essays and novel excerpts have appeared in journals like MAKE Magazine, Annalemma (3 & 4), Flashquake (Winter ’05, Spring ’09), Word Riot, Pindledyboz, The 2nd Hand. He teaches at Columbia College Chicago, where he earned his MFA, and is the Chicago literary correspondent for The Examiner. NEW LOCATION! 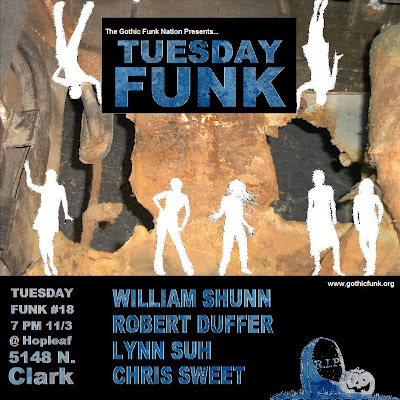 This month’s Tuesday Funk will take place at The Hopleaf, 5148 N. Clark St., Chicago. RAYMOND L. BIANCHI is a native of Chicago and the child of Italian Immigrants. He lived and worked for most of the 1990’s in Bolivia and Brazil, first as a volunteer and then in publishing. He is the author of two books of poetry: Circular Descent (2003) from Blaze Vox Books and Immediate Empire (2008) from i.e. Press. He was the guest translation editor for Aufgabe 6 which included a section of 18 Brazilian poets that he translated. His translations of Brazilian poet Sergio Medieros will appear in the fall 2009 edition of Mandorla Magazine from the University of Texas press. He also serves as Publisher and co-founder of Cracked Slab Books of Chicago. 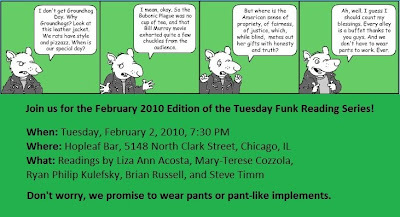 In that capacity he served as co-editor for The City Visible: Chicago Poetry for the New Century in 2008. He blogs at www.irasciblepoet.blogspot.com. Following a lifetime career in dance, MAGGIE KAST received an MFA in fiction from Vermont College. She has published stories in The Sun, Nimrod, Kaleidoscope, Rosebud, Paper Street, and Carve. Her essays and memoir excerpts have appeared in Americ2a, Image, Writer’s Chronicle, ACM/Another Chicago Magazine, and others. Her book, The Crack between the Worlds: a dancer’s memoir of loss, faith and family, has just been published by Wipf and Stock and is available at bookstores and www.wipfandstock.com. 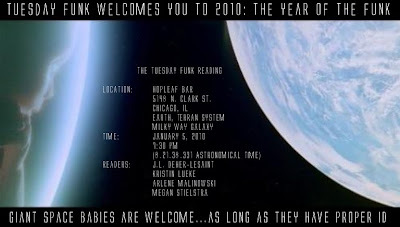 Read excerpts at www.maggiekast.com. ARLENE MALINOWSKI – As actor, educator, and writer Arlene views solo work as an artistic extension of the social justice work she has been doing for the last twenty five years. Her five solo plays including What Does the Sun Sound Like and Aiming for Sainthood have been produced and performed in venues nationwide including St Louis Center of Contemporary Art; 16th Street Theater, Chicago; Los Angeles Women’s Theatre Festival; HBO Workspace; NoHo Theatre Festival; Ojai Solo Series; National Center on Deafness; West Coast Ensemble; and Blue Sphere Alliance, as well as at numerous colleges throughout the country. Most recently she performed a new piece which was named one of the five best solo shows by Windy City Times. Her solo work has been honored with an LA Garland Award and nominations for the LA Weekly Award and the Los Angeles Theatre Ovation Award. As an actor she has appeared in numerous theater productions including the world premiere of By the Music of the Spheres at the Goodman Theatre in Chicago. Other favorite roles include Lovers and Other Strangers, Labor Pains, Chapter Two, One Flew Over the Cuckoo’s Nest with Deaf West, the critically acclaimed In A Different Voice and Faith, Hope and Clarity. LAURA TIEBERT is a travel writer and author of four guidebooks to Chicago, including Frommer’s Chicago with Kids, Frommer’s Chicago Day by Day, Chicago for Dummies, and the forthcoming Frommer’s Chicago Free and Dirt Cheap. She has ghostwritten eight For Dummies books, ranging from Blues for Dummies with Chicago blues legend Lonnie Brooks, to Beauty Secrets for Dummies with supermodel Stephanie Seymour. Studying with Chicago performance artist Brigid Murphy, she completed her first novel, Sapphire Dunes, a romantic novel about a feisty and chic young Chicago journalist who follows her heart to a Middle Eastern country and comes home with a great feature story… and possibly the love of her life. Laura is currently working on her second novel, Home Economics, about a 45-year-old mom on the verge of a nervous breakdown (the breakdown all moms would like to have but can’t afford to), whose dead mother-in-law starts speaking to her through a 1950s Sunbeam mixmaster. (Yes, exactly like the mixmasters on display in Tuesday Funk’s former home, Flourish). 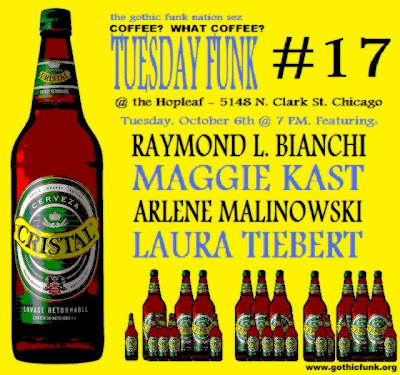 We are happy to announce that our October 6th reading will take place upstairs at Hopleaf Bar, 5148 N. Clark Street (just south of Foster) in Chicago’s Andersonville neighborhood. For those who haven’t been there yet, it’s a gorgeous restaurant and bar with some rave reviews and an impressive menu of beer and wine. So arrive early, grab a good table, and order some food before the reading starts at 7 PM. RAYMOND L. BIANCHI poet and Cracked Slab Books co-founder joins us from Series A, MAGGIE KAST reads from her newly published memoir The Crack between the Worlds: a dancer’s memoir of loss, faith and family, solo performer ARLENE MALINOWSKI will bring her theater work to the Tuesday Funk stage, and LAURA TIEBERT will read from her novel in progress in which a woman’s dead mother-in-law starts talking to her from a 1950s Sunbeam mixmaster. So mark your calendars. Invite your literary friends, your beer drinking friends, and your foodie friends. There’s going to be something for everybody!